My step-father, Chuck, died yesterday. I didn't even know the depth of my sadness existed until that moment. I've always considered the term step-father to be ill fitting considering the role he played in my life. Let's call it what it is. It was completely unexpected and I think I'm still in shock. He was driving home from Louisiana on Thursday afternoon and knew he didn't feel quite right. He got home and took some medicine to ease the aches he was experiencing. My mom was already getting ready to go to the ER because she knew by the way he was acting that they'd be heading that way soon. They drove to the hospital both expecting some kind of treatment for the flu. They drove there fully expecting to be driving back that same evening. By 2AM he was admitted to ICU, by 6AM he was sedated and on a ventilator. Yesterday morning, he went to be with The Lord. Receiving a call at an odd time is the worst feeling in the world. The ringer was ringing in unison with the beating of my heart. I knew something was wrong. I could tell by the way my mom's voice cracked that things were bad. She called at 6:05AM and we were out the door by 6:17. It was a long blur in the ICU. We waited for hours upon hours. We left only when they forced us to because visiting hours closed from 6-8 in the evening. The hospital volunteer in the ICU was amazed because she said she'd never seen so many visitors for one person. At one point there were over 35 people staked out in the waiting room. We had puzzles, snacks, and laptops. We were a waiting army. There were prayers, tears, and hugs. There are still a lot of those. peace. He is fully restored in Heaven where death has no victory or sting (1 Corinthians 15:55). Chuck was diagnosed with MRSA, which is a very dangerous form of Staph. His body was not responding to the antibiotics, and the doctors had done all they could do. He went peacefully, and in no pain. We are all trying to be strong for one another. I keep experiencing what I have deemed the pain tornado. I'll be sitting and chatting when, mid-converation, the reality will suddenly hit me and I get a piercing pain sensation in my stomach. It's an emotional pain that is somehow manifesting itself physically. I've never felt anything like it. I've had a lot of pain tornados today. I can't even imagine how my mother is feeling. I've been glued to her side. She's swirling in one continuous pain tornado. It all just happened so fast. Chuck and I didn't always see eye to eye, but he made me strong. 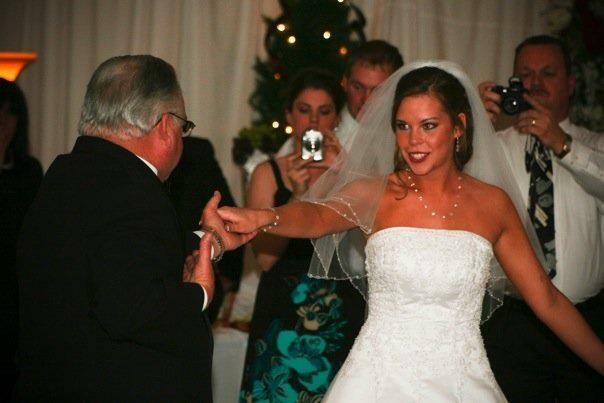 I'll never forget my wedding day when he gave me a necklace and told me that he was so proud that I'd found a love like the love he'd found with my mom. He was so proud to walk me down that aisle and give me away to man that he was certain would love me forever. The entire reason for this post is to update everyone and to let everyone know that our adoption fundraiser RACE IS STILL ON! It was already going to be an emotional race, and now I have one more reason to run. One of the biggest patterns I've detected when it comes to the pain tornado is that it always comes when I think of the fact that Chuck will not get to see me be a mother. He won't get to see Adam and I as parents. I wanted that so, so bad. I am running for my sweet child and for my sweet child's Paw Paw Chuck. It won't be easy, but he would have wanted me to run. The compassion and love we've felt from everyone has been overwhelming. We are so grateful for the prayers. My hope is that the pain tornados will subside. I know it will take time, and they will happen fewer and fewer as time goes on. I'm sitting at our kitchen table where we ate thousands of meals together. The tears in my eyes are uniquely refreshing. There's so much value in memories. For now, I'm gearing up to run a race in honor of two precious and amazing individuals who I can't imagine my life without. My baby and my dad. I barely know what to say, friend. I'm sad for you and so proud of you at the same time. Please know you're in my thoughts and prayers!